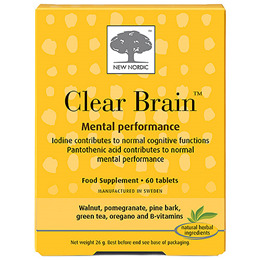 The Clear Brain formulation is based on a natural extract combination as well as vitamins and minerals. The content of iodine contributes to normal cognitive functions. Pantothenic acid contributes to normal mental performance. Riboflavin, niacin, vitamin B6 and B12 reduces fatigue and contribute to the normal function of the nervous system. Niacin, vitamin B6 and B12 contribute to normal psychological functions. The brain is the largest and most important part of your nervous system. It contains billions of neurons, and is home to thoughts and feelings. It receives and coordinates signals from your senses, movement and memory. The normal function of the brain is dependent on many different nutrients. Filling agent (di-calciumphosphate dihydrate, microcrystalline cellulose), pomegranate extract (Punica granatum L.), green tea extract (Camellia sinensis L.), french maritime pine bark (Pinus pinaster, Aiton), walnut extract (Juglans regia L.), vitamins (niacinamide, calcium-D-pantothenate, cyanocobalamin, pyridoxine hydrochloride, riboflavine, thiamin mononitrate, folate), disintegrator (crosslinked sodiumcarboxy methylcellulose), coating agent (hydroxypropyl methylcellulose), pepper extract (Piper nigrum L.), oregano oil (Origanum vulgare L.), anti-caking agent (silicon dioxide), mineral (potassium iodide). 2 tablets per day with a meal. Not suitable for children under 11 years of age. 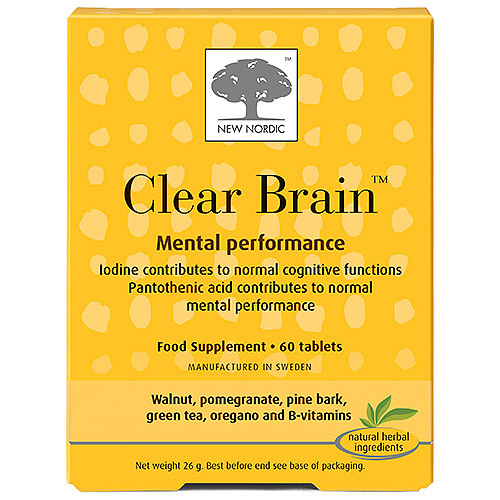 Below are reviews of New Nordic Clear Brain - 60 Tablets - Best before date is 31st May 2019 by bodykind customers. If you have tried this product we'd love to hear what you think so please leave a review.